When one thinks of religious artists, Andy Warhol is usually not the first name to come to mind. Best known for his Factory-created silkscreens of Hollywood stars like Marilyn Monroe and Liza Minnelli and iconic American commodities like Coca-Cola and Campbell’s Soup, Warhol’s work seems about as far from devotional as one could imagine. Many people, even art historians (myself included) are surprised when they discover that Andy Warhol was a devout, lifelong practicing Catholic. The shy, awkward, and sickly son of working class Czech immigrants Andrej and Julia Warhola, Andy Warhol (he self-consciously dropped the “a” at a young age) spent much of his childhood at home with his mother while Andrej struggled to find work during the Depression. Like many immigrant families, the Warholas tried to preserve many familiar things from their life in Czechoslovakia: potatoes, pierogis, and their Eastern Byzantine Rite Catholic beliefs. In Pittsburgh, the Warhol boys (Paul, John, and Andy) attended Ruthenian Catholic mass at St. John Chrysostom Church, a congregation comprised largely of Eastern European immigrants like themselves. Julia Warhola, a folk artist who would go on to help her son with many of his artworks, would often draw religious pictures for her children, and the family house featured religious icons in every room. Young Andy even made a seventeen-inch plaster of Paris religious shrine that he kept in his bedroom. When Andy left his Carpatho-Rusyn neighborhood in Pittsburgh for New York City in 1949, one might assume that he would leave his Byzantine religious beliefs there as well. After graduating from the School of Fine Arts at the Carnegie Institute of Technology (now Carnegie Mellon University), Warhol was eager to enter the New York art scene, and his brother John stated that he was shy about revealing his religious beliefs in New York. However, shyness or no shyness, Warhol attended mass in New York every week for the rest of his life. When his mother followed him to New York in 1951, they would attend services together until her death in 1972. In his published diaries (dictated to Pat Hackett during the 1970s and ‘80s), Warhol’s devotion to Catholicism is constantly in evidence. Nearly every Sunday entry begins with, “Got up and went to church.” In other entries, Warhol talks about getting a crucifix to hang in the Factory, going to church on Palm Sunday to gather the palms, and collecting holy water in a peanut jar to cleanse his apartment. Warhol’s faith was combined with a deep sense of Catholic social obligation, and he often volunteered at soup kitchens. 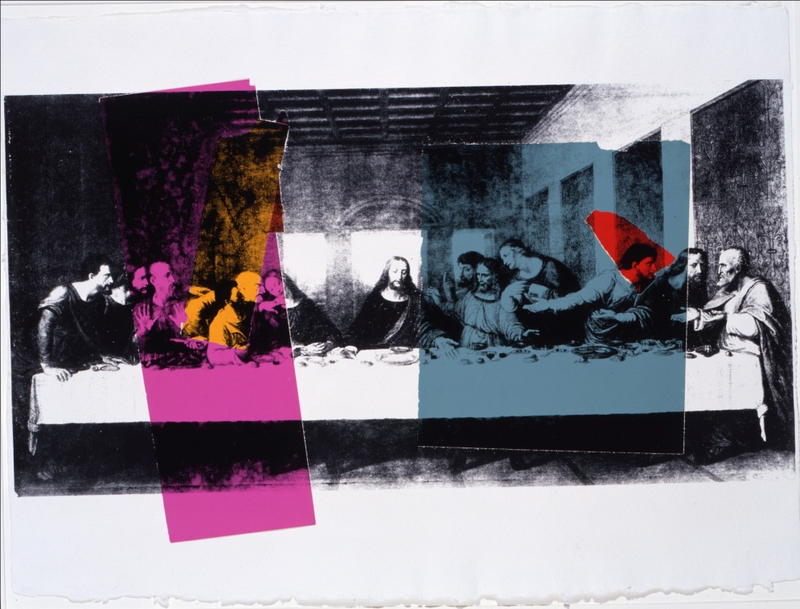 Religion does make an appearance in Warhol’s artwork, both overtly and covertly. Especially in his later years, Warhol appropriates the great religious masterpieces of the Renaissance like Raphael’s Sistine Madonna (ca. 1513-14) and Leonardo da Vinci’s The Last Supper (1495-98). 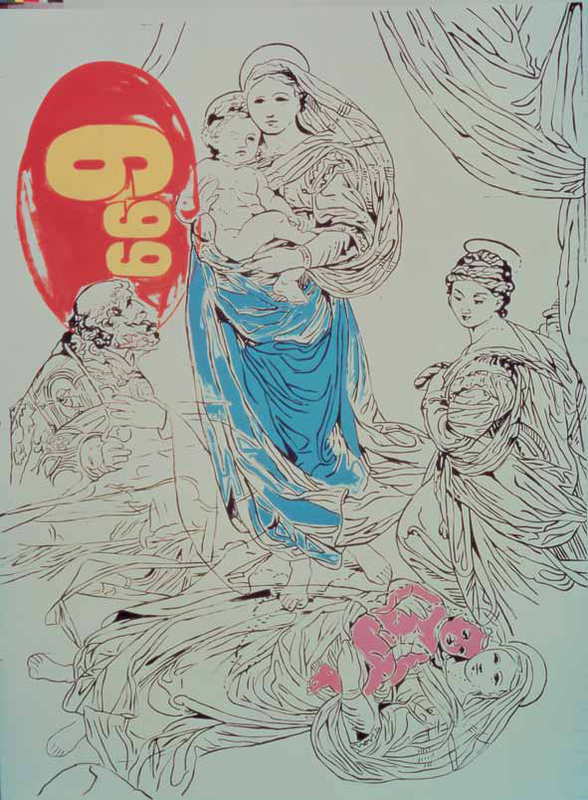 Andy Warhol, Raphael Madonna-$6.99, 1985. Andy Warhol, The Last Supper, 1986. The works that Warhol appropriates – Raphael’s and Leonardo’s- are celebrities of the art world in the same way that Marilyn Monroe and Campbell’s soup were celebrities of their various spheres (Hollywood and the American supermarket shelf, respectively). Warhol utilized images that were immediately recognizable and had been so massively reproduced that their original devotional meanings had been all but lost. Works such as these (and there are a whole slew of The Last Supper-inspired works by Warhol, including some involving a black light) involving famous religious scenes, make the viewer question whether Warhol is tipping his hat to his religious beliefs, mocking now-meaningless icons with further commoditization, or (and this is my belief), a complex, very Warholian combination of the two. The diptych is an ancient form of two flat sides connected in the center, best known for its religious uses. 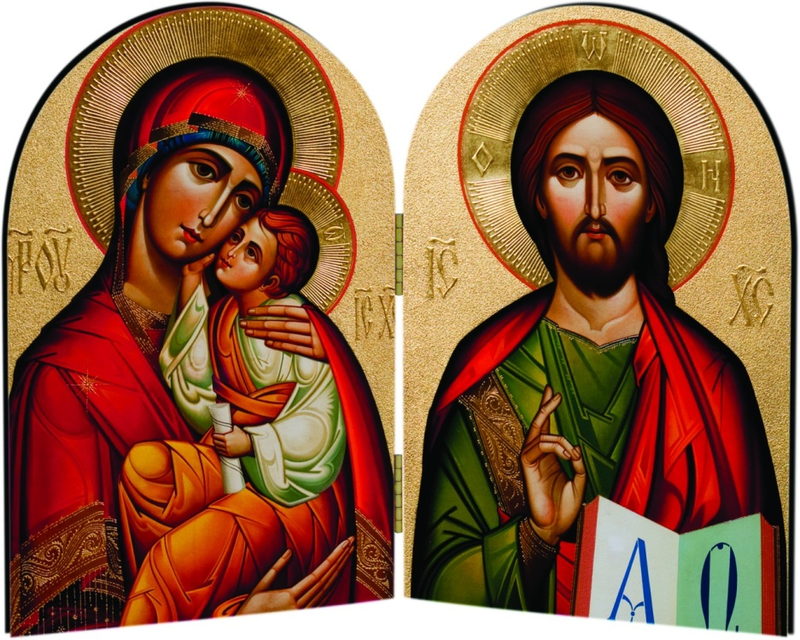 In Byzantine Catholicism (the Ruthenian church attended by Warhol falls under the umbrella of the Eastern Catholic Church), religious icons like the Madonna and Christ are often depicted in diptych forms, which folded for travel and allowed people to carry devotional objects with ease. 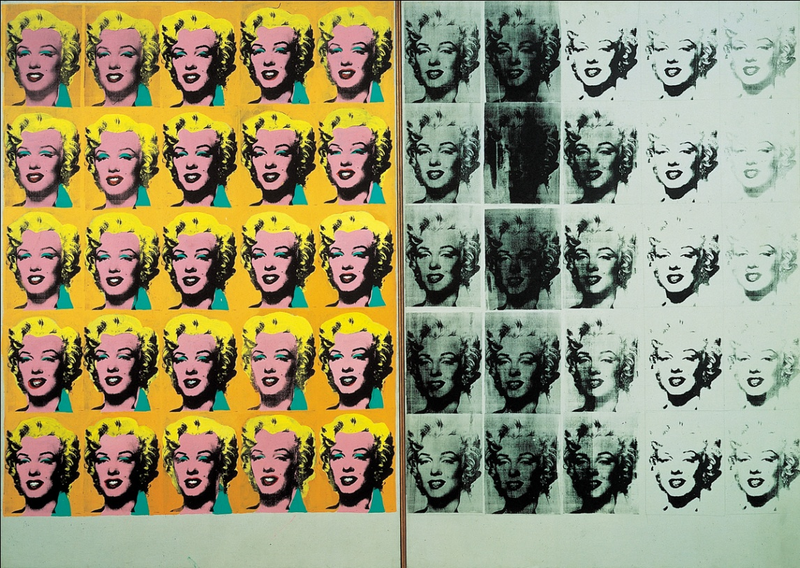 Many Warhol pieces involve different panels; the Marilyn Diptych is perhaps the most famous and best example of Warhol’s appropriation of a well-known religious form. The world-famous artist, painter of celebrities, and society oddball still clung to the comforts instilled in him in working class Pittsburgh. Warhol’s religious beliefs, although kept fiercely private by the artist himself, were a major part of his life and his art. I confess that I was enchanted with pop art Catholicism, which is the first time I see this kind of art, simply wonderful.